SOLD:1971 Pinzgauer 710M $10K - Page 2 - THE PORTAL HUB - Pinzgauers, Haflingers, Volvo 303s and more! Is there any cabin heater of sorts installed? Just the factory stuff nothing aftermarket. 1.) If I know how much shipping would be to their house? As the buyer that would be something you would want to look into on your own before contacting me. Im sure there’s a lot of good shipping companies out there and I’m willing to meet anyone’s shopper if needed. 2.) If they could drive it home? 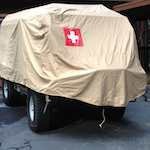 It’s a +40 year old Swiss Military Truck. Unless you live in Arizona I would not recommend driving it across country unless you take the back roads and plan on it taking a long long time. It’s not like you can pull up to Napa AutoParts if something does go wrong and get parts. Yes it’ll do 65mph but I don’t believe that’s something you’d want to do all day. It’s not designed for the highway. I cruise all day at 50-55mph that’s were I feel it’s most comfortable but semis passing you on the freeway all day long would get old and not to mention you’d probably be deaf after driving this cross country on the interstate all day. Last edited by BigTree4x4 on Tue Dec 04, 2018 9:47 am, edited 1 time in total. Carrier costs are extremely expensive these days. With all the disasters on both coasts moving construction materials at a priemum is driving these costs through the roof. That said if someone is really serious, it’s an adventure worth taking to fly down and drive her home. That’s what I did years ago and it was a lot of fun — assuming of course it’s in decent driving condition. IMHO a passionate buyer will figure it out. Absolutely you make it an adventure driving it home. It would absolutely drive anywhere. I guess I’m just trying to let people know that don’t have experience with a Pinzgauer that it’s not really designed to drive cross country on the interstate. If you took the back road 2 lane highways that always offer the best views it’d would be more happy there. If it were me I'd change all the gear oils out to Redline or Royal Purple, carry some extra motor oil with me and head out!